Centrifugal Pump with AC motor, with all internal components such as bearings, seals, mechanical seal, rotor and bolts. Model is in native Solidworks 2018 Assembly format, which allows complete editing of the design and dimensions, as each part has the complete design feature tree with sketches and features fully editable, this model was created with the full version of Solidworks, not the student version. Additional parametric formats included such as STEP, IGES, X_D and CGR are also included. Included are OBJ and FBX formats as well, with materials specified but may need additional textures based on the application you want it for. Every part of this assembly can be individually taken apart and inserted separately in scene or used individually from the other parts. Model can also be easily animated with a cross sectional view, this is suitable for educational purposes to illustrate how centrifugal pumps work. 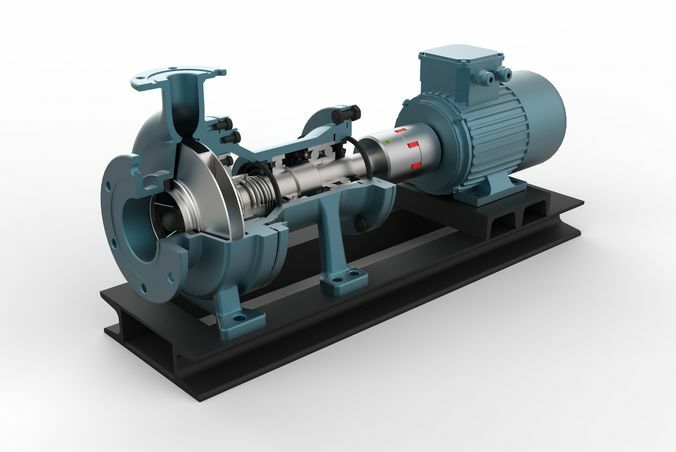 The rotor of this pump was designed accurately with its geometry in accordance with turbo-machinery laws. Keyshot Scene is included will all materials applied and ready for renders.